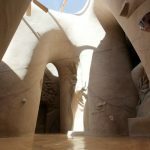 Cavedigger Cave walls are the canvas for artist Ra Paulette and his vision of sacred space For the past 25 years, artist Ra Paulette has been digging cathedral-like, “eighth wonder of the world” art caves into the sandstone cliffs of Northern New Mexico. Each creation takes him years to complete, and each is a masterpiece. Paulette calls them his “wilderness shrines,” massive in scale and poetic in their design. The cave we’ll visit in Embudo was one of Paulette’s first creations and took him two years to complete. We’ll take a tour of this beautiful, light filled, sculptural space with the artist and enjoy a delicious lunch prepared with locally produced food afterwards. Lunch will be served in a lovely pavilion. 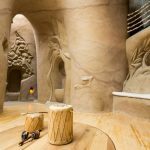 In addition to the tour, we have a very special opportunity for two couples to dine and sleep in the carved cave overnight. Two tickets are available for the night before (June 24) and two for the night of the event (June 25). Amenities include one double bed, bathtub, refrigerator, microwave, and outhouse. Please call Kitchen Angels for more details if you are interested in this once-in-a-lifetime opportunity. Saturday, June 25 9:00 am – 4:00 pm Limited to 40 guests – $150/person, $500/pair for overnight tickets (which includes tour) Location: Embudo, NM Sponsor: Jill Markstein Hosts: Ra Paulette, Shel Neymark, and Elizabeth Riedel A full event will raise funds for 1029 Kitchen Angel client meals!